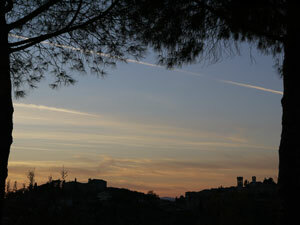 Find and book hotels in Umbria. With location maps and guest reviews. The region of Umbria is in central Italy, and is an attractive destination for a low-key, pleasant holiday. Geographically next door to Tuscany and Lazio, Umbria has long been a favourite destination for foreign tourists who find the other regions too full of their countrymen. Umbria is one of the few Italian regions to have no coastline, and its countryside is green and fertile, much of it wooded and hilly. Umbria is one of those destinations which, when mentioned to an Italian, will provoke the lip-smacking comment: 'You'll eat well there'. Local delicacies include wild boar and the highly-prized truffle. For those with a sweet tooth, Perugia is one of Italy's chocolate capitals. As well as gourmands, Umbria's green countryside is popular with walkers and cyclists, and those looking for a peaceful retreat. Umbria offers the kind of holiday where you can take life slowly, savouring the local specialities, pottering around small medieval towns and really getting to know Italy. Although a hire-car is useful for a touring holiday, the region is connected well enough to be explored by public transport. Umbria's 'regional international airport' is close to Perugia, and is called the Aeroporto Internazionale dell'Umbria, or Perugia Sant'Egidio. Despite the grand titles, it is only served by a few flights. Ryanair, at the time of writing, offer budget flights to Perugia from London Stansted. Alternative airports are in neighbouring regions and will involve at least an hour or two of travel to reach Umbria's main destinations. The most convenient budget airports for Umbria are Ancona (a short train trip away, in Le Marche), Rome (from Fiumicino airport there is an occasional direct coach service to Perugia) and Pisa. The main towns in the area are well-connected by train to other central Italian cities, such as Florence and Rome. Buses serve more outlying destinations. Assisi is one of Umbria's most-visited destinations, attracting pilgrims to its sites associated with the gentle St. Francis. Spoleto is a well-preserved hilltown surrounded by attractive countryside, and is famous as the home of the annual Festival dei Due Mondi, when culture junkies descend and the narrow streets ring with music. Orvieto is also a popular tourist destination. 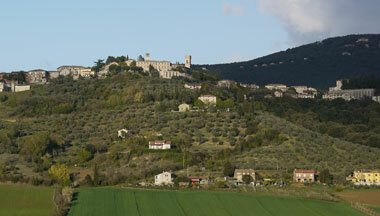 An Etruscan hilltop town, it offers fascinating underground archeological tours, as well as an imposing Duomo. The region's capital, Perugia, is a very attractive historic town. Lake Trasimeno (see Italian Lakes) is Italy's fourth-largest lake, and is another of Umbria's quiet jewels, located to the west of Perugia.